Manila—(PHStocks)—The Philippines’ second investment grade rating, given by credit ratings firm Standard and Poor’s, has boosted the local stock market to a new high – the 28th so far recorded this year. The benchmark Philippine Stock Exchange (PSE) index surged by 1.72% or 121.93 points to close at 7,215.35 – a new record high for the local bourse. 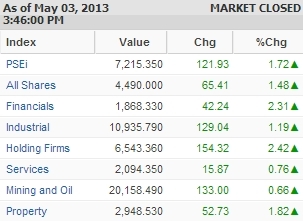 All counters are back in the green, led by the Holding Firms index, which gained 2.42%. The Financials came in at second with an increase of 2.31%, while the Property sector went up by 1.82%. 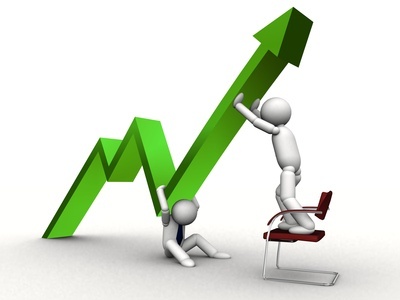 The wider All Shares index, on the other hand, went up by 1.48% to 4,490. Trading was heavy, with value turnover reaching PhP15.83 billion on 3.53 billion shares traded. There were 120 gainers against 71 decliners, while 30 stocks were flat. The top active stocks in terms of value are Alliance Global Group Inc. (PSE: AGI), Philippine Long Distance Telephone Co. (PLDT, PSE: TEL), Ayala Land Inc. (PSE: ALI), SM Investments Corporation (SMIC, PSE: SM), and Universal Robina Corporation (PSE: URC).